Alpaca (Lama guanicoe paca or Vicugna pacos) is a camel – animal which is related to the llama of the South American Andes. There are no wild alpacas. 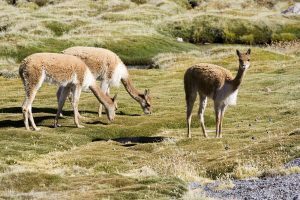 Alpacas are domesticated versions of the threatened species, vicuñas, South American ruminants that live high in the Andes. Humans started domesticating alpacas about 5-6000 years ago and bred them for their wool. Thus far Europeans have been using the wool for handcrafts. There is still almost no industrialized processing of the wool. Quiet and peaceful alpacas with characteristics of pets are also used in Germany for animal-assisted therapy. 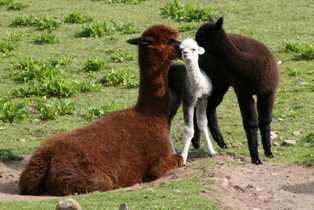 There are two breeds of alpacas, Huacaya and Suri. They differ in in their fiber structure. Huacaya alpacas ull has a fine, curly fiber with some covering hair. 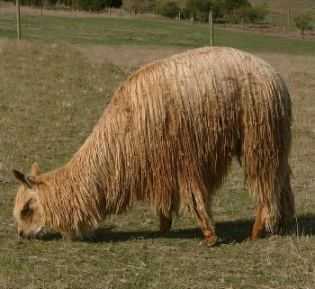 Suri alpacas have long, dreadlock-like fibers which hang on the body. This makes them appear thinner than the Haucayas. 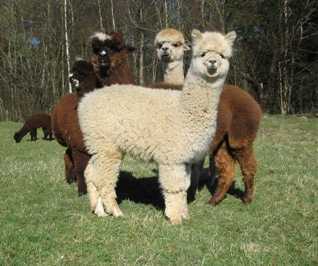 The alpaca’s body form is relatively long. They have slim legs, a long, thin neck and a small, triangular shaped head. The alpaca has a two-toed foot with a pad and 2 claws. It can be 80 -100 cm at the withers and weigh between 55 and 70 kilograms. The colours vary from pure white to beige, brown, reddish brown, grey and black, with many nuances. There are even mulit-coloured animals in many variations. Alpacas are herbifores and get all their nutrition almost exclusively from grass, or hay and ensilage. Their three-part stomach eases digestion. The gestation period of an alpaca is slightly more than 11½ months (+/- 2 weeks). The mare is normally paired two weeks after a birth and thus will give birth to a foal every year( “Cria” in South America). The foal suckles for 6-8 months. Females reach sexual maturity when they are between 12 and 24 months of age, males: between 24 and 48 months. Life expectancy is between 20 and 25 years. Alpacas have a rich language which includes a humming sound which sometimes can sound like a human who is holding a hand over his/her mouth. There is a variety of body language signs used by alpacas – raising and lowering head, turning the ears in different ways. Like llamas, alpacas can spit. It is very rare that they spit and that almost only happens toward other alpacas and very seldom toward people. Nearly the entire alpaca population was slaughtered during the Spanish invasion of Peru and only those who fled up to the high mountain country could save their animals. The extreme climate was an agent for natural selection and was most likely the reason that alpacas are animals with great endurance and resistance. They are seldom afflicted with sickness or disease.